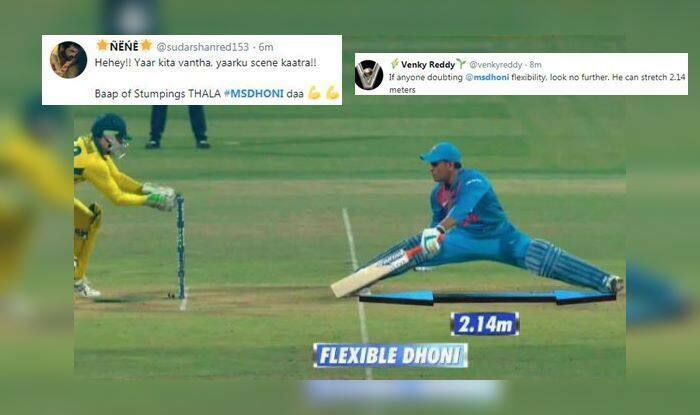 Former India captain MS Dhoni showed an incredible stretching ability to avoid getting stumped during the ongoing 2nd T20I at Chinnaswamy Stadium. Former India captain MS Dhoni showed an incredible stretching ability to avoid getting stumped during the ongoing 2nd T20I at Chinnaswamy Stadium. Dhoni had just walked in at the departure of Rishabh Pant. It was the second ball he faced and Adam Zampa was the bowler. Dhoni looked to chip down the track, as Zampa bowls a quickish floater and beats Dhoni. Dhoni was out of his crease and stretched full-length to get back in the nick of time before the wicketkeeper took the bails off. Meanwhile, Dhoni scored 40 off 23 balls as his innings was laced with three humungous sixes and the same number of boundaries. India has posted 190/4 in their 20 overs. Kohli remained unbeaten on 72 off 38 balls.